This old barn straddles Glenn Squires' driveway just off Cash Mountain Road in Hot Spring County, Arkansas. You can catch a glimpse of his house through the back of the barn. The yellow lab is Glenn's dog. 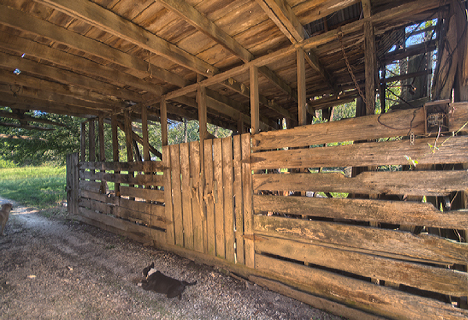 The Boston Terrier relieving himself at the corner of the barn belongs to Linda Hanks, a neighbor from across the road. We think no less of the pooch. When you gotta go, you gotta go. The three of us, plus the dogs made a social event out of the barn shoot. You purely and simply do not see a driveway to a residence snaking through an old barn every day. In fact, unless you happen to proceed down Cash Mountain Road in Hot Spring County, Arkansas, the probability of seeing such a phenomenon is slim to none. At least that’s been my experience to date. The driveway and barn belong to Glenn Squires and his family. He was kind enough to not only allow me to photograph his barn, but accompanied me while I did the deed. To see more pictures of the barn inside and out — and get in on the story of shoot, may I suggest that you go to the Photo of the Week Page at Corndancer dot-com where this story started. We’ll wait on you right here. 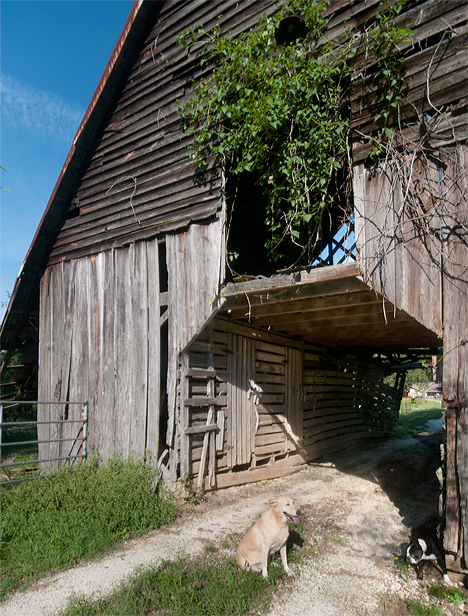 We also are grateful to photographer Fred Garcia, who first shot the barn, for revealing the location. As you are driving through the barn to reach the Squires domicile, this is what you see. It is large enough to pass a full-size pickup, but it is a good idea to hold the wheel steady as you do lest you get into a scrape with history. The Boston Terrier decided the gravel was cooler inside the barn than out. 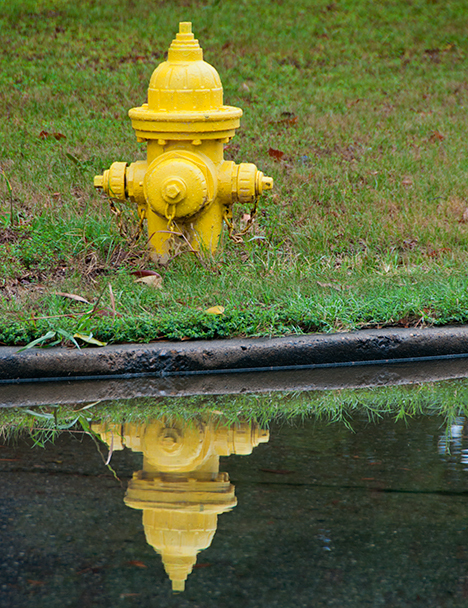 Glenn Squires' yellow lab can barely be seen to the left. I wound through the countryside toward my destination aided by maps and an iPhone with a really cool map function. Replete with my faith that I always stumble on something you don’t see every day, I took Reynolds Creek Road off U.S. Highway 67 north of Malvern as my jumping off place. 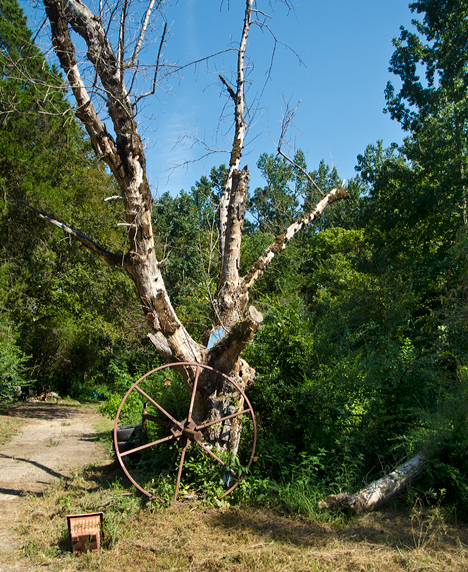 Sure enough I ran up on a giant wheel in front of an old tree. At first blush, I could not figure out what the wheel was or why it was there. Further and cautious investigation led me to believe that this is the entrance to an unmanned country junk-yard. It was not until I enlarged the pictures that I finally figured out what the wheel was. The moment was one of those slap your head, stoop your shoulders instants of clarity and revelation when you feel dumb. 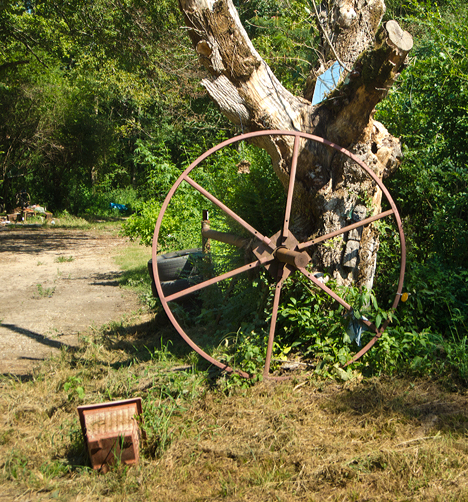 Upon closer examination when I enlarged the picture, I discovered the wheel is part of a pole gate. The wheel rolls and lo, the gate closes. Pole gates, for the uninitiated, consist of a heavy-pipe or pipe framework on some sort of hinge mechanism designed to limit access to roads and driveways. They don't work well where there is man-portable booty behind the gate, but work fine to limit miscreant vehicular access to large, heavy stuff, or to merely deny entry to vehicles. Deer clubs and forestry companies love 'em. To get to Cash Mountain Road, I had to travel up Gourd Neck Valley Road from Old Military Road. You will not be tested on this. At the junction of Old Military and Gourd Neck, I found a younger cousin to the target barn. It was badly back lit, so I resorted to post-processing skullduggery to get an acceptable image for your review. See the “doctored” barn and more pictures of the barn with the driveway through it in our Weekly Grist Gallery. Since political artillery is exploding all around us, it is appropriate that we take a look at how certain natural elements may reveal political proclivities. The tree below could be one of those. 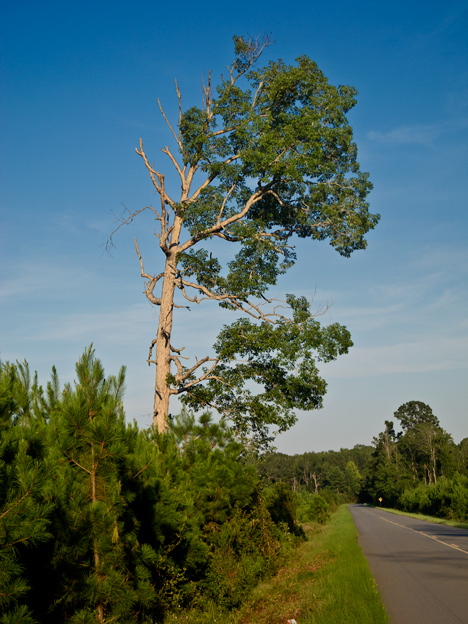 Can anyone venture a guess as to the political persuasion of this tree? 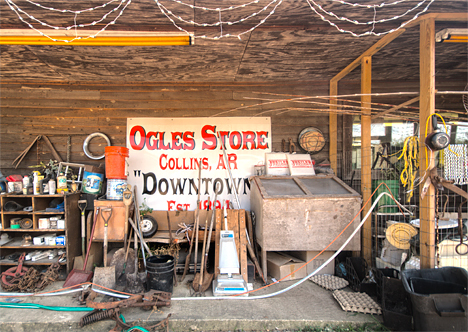 Ogles Store at Collins, Arkansas sold its first piece of merchandise in 1874. 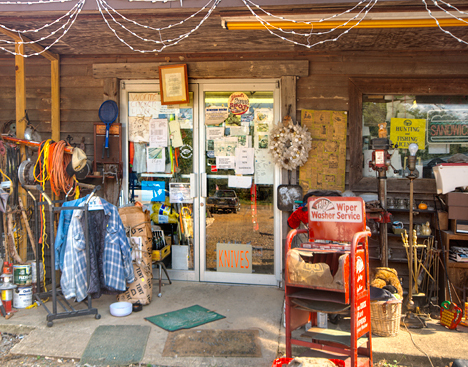 Doy Ogle, grandson of the original proprietor, John Ogle, owns and operates the store today. The store's inventory includes more than the average person can imagine. Here we see shovels, a wheelbarrow wheel, a cricket box, fishing poles, extension cord, vacuum cleaner, wheel ring, a chain hoist, and other whatchamacallits and doo-dads which defy description. Ogles Store in Collins, Arkansas is the only game in town. The closest other stores are 15 miles west and eight miles east. It wasn’t always that way. Not long after Ogles opened its doors in 1874, there were seven other stores in Collins all vying for the same customers. Now 137 years later, Ogles is still at it which tells us that they’ve been doing something right since the git-go. Collins is south of Seven Devils Swamp, west of Dermott, Arkansas, and east of Monticello, Arkansas, just in case you were curious. 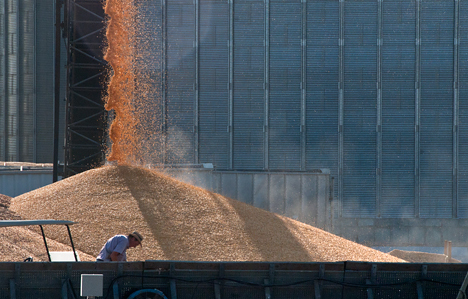 This story started on the Photo of the Week page at Corndancer dot-com. Go there to get in on the start of this story and see pictures of the inside of the store. Also get a bit more store information. We’ll wait here while you visit. To get into the store, you must stroll through merchandise displayed at the approach to the front door. As you look at what’s offered, you know you are not shopping at the average store. Let’s face it. Where else could you find fuel cans, circular saw blades, antique signs, a trailer hitch, a kitchen canister, a couple of old bug sprayers, an extension cord, a child’s stool, and a sledge hammer all conveniently arranged for immediate inspection? Precious few I suspect. 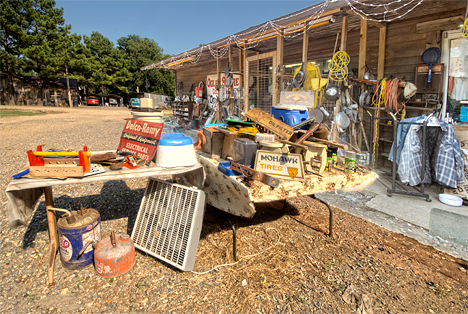 The east outdoor shopping display at the entrance to Ogles Store. If you are of a curious nature, Ogles is like a candy store for persons of your ilk. When you reach the front door, the selections continue. Clothing, fireplace tools, extension cords, a drill press next to a floor lamp and more. You also see a plethora of signs and notifications on the front doors. Do not despair, you will not be tested on the content of these. A whole world lies waiting behind door number one. Cruising through south Arkansas, my main image hunting grounds, I find subjects to which I will return when the light is better or when I have time to make the shot. The old store at Coleman, Arkansas was high on that list and has now been checked off. The old gas pump, home-made window grids, “coal-oil” pump were too much to resist. 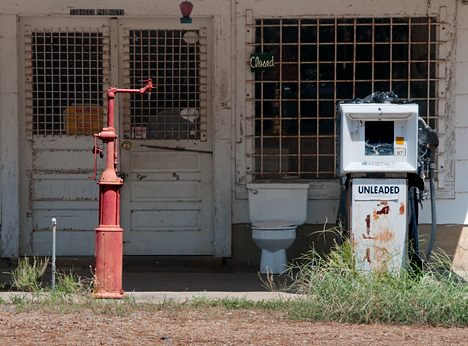 The "coal-oil" pump and the gas pump at Coleman Store at Coleman, Arkansas are easy to explain. The potty, I'm not so sure. At least it is a good place to take a seat out of the 100° sun. At the junction of Arkansas Highways 277 and 54, you will find Coleman Store, at Coleman Arkansas. Congratulations. You and I can find it, but Google can’t. They don’t know what they are missing, which is a fine old store. 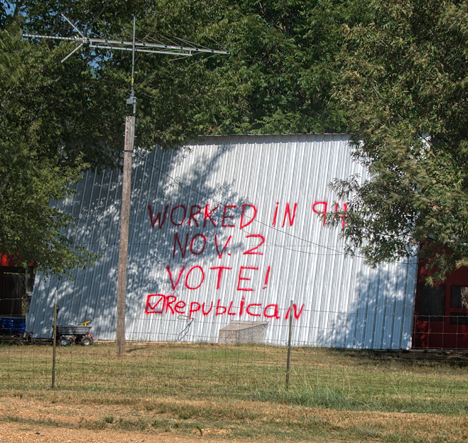 Several miles further south, less than a quarter of a mile from one of our favorite places, Selma Methodist Church, at Selma Arkansas, the 2012 campaign has kicked off — with Krylon and the side of a barn. Critters do what they can to beat the heat. 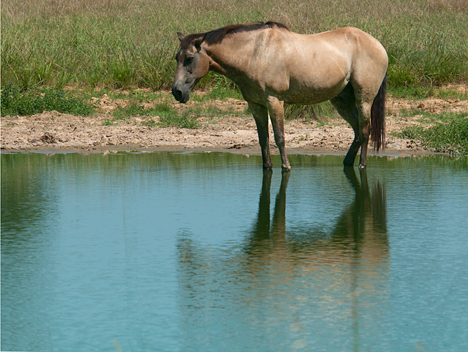 This nice looking buckskin is standing in the pond, probably pondering the idea of venturing deeper. His cow friends will have no such trepidations. They will go leg-deep into a pond in a heart beat. Come on in, the water's fine. Honest. Notice the bare ground at the edge of the pond. Where the grass starts is the normal water line. It's been a while since south Arkansas has had a significant rain. My buddies down in Cleveland County tell me it's so dry they're catching catfish out of the Saline River with ticks on 'em. 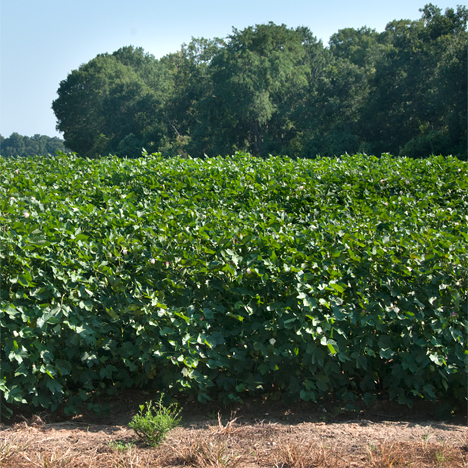 Almost everyone has heard the term "standin' in tall cotton." Well friends, this is real-live tall cotton. The outside rows nearly hit me in the chin and I am 6-3" tall. (Formerly 6-6" tall until the onset of multiple birthdays). On the way home, sunset started happening at McGehee, Arkansas. 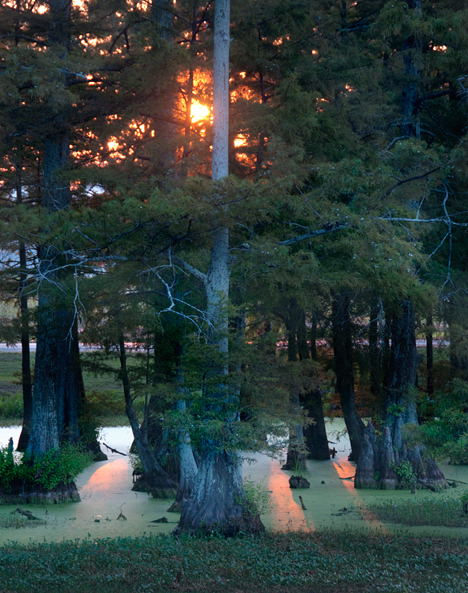 The sun had dipped behind the fine cypress trees in Wiley McGehee Memorial park on the west side of U.S. Highway 65. Sunset behind the cypress at Wiley McGehee Memorial Park, McGehee, Arkansas. Nice. I arrived just in time to catch the sun behind the trees and sun colors across the deer grass and water in which the cypress stand. The timing was dumb luck and perfect. The Lord continues to take care of fools and drunks. 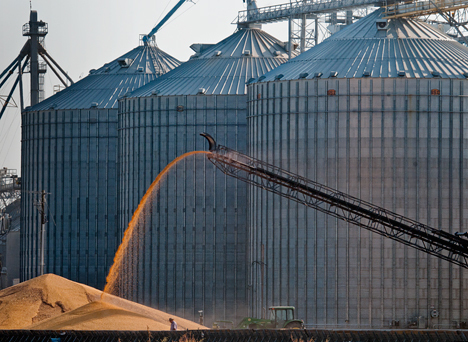 SEE MORE on our Weekly Grist Gallery. More store. More of this trip including Selma Methodist Church – 29 pictures in all in a larger format. See a curious cow, the highway patrol and wreckers at the site of an 18 wheeler breakdown and more in our Weekly Grist Gallery.